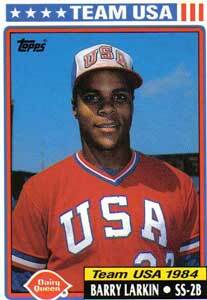 Today, Barry Larkin became a member of the Baseball Hall of Fame. I first contemplated this day more than a year and a half ago, and it was one of the first stories imported to this site last August. The first newspaper I read seriously and regularly was the Wall Street Journal. A test preparation company gave me a free print subscription, and I milked it as long as I could by doing things like stopping delivery when I was away, which had the effect of tacking more issues onto the end of the subscription. When it finally dried up, a friend on his way out at Dow Jones, the family driven organization that used to control the Journal before News Corp took over, lined me up with an online subscription, which carried me another year or so. By that time, newspaper websites were in full bloom, and a subscription really didn’t mean anything. When the family split and Rupert Murdoch took over, a digital lockdown followed closely on the heels of a substantial (if sometimes misguided) increase in content. No worry, though, as a free and easy workaround makes it simple to get behind the Journal’s paywall. All you have to do is…. Well, I don’t want my cell phone hacked, but, as Jimmy Cliff said, you can get it if you really want, and frankly, it isn’t even that tough. Uh, hockey? Right. The WSJ has a regular feature called The Weekend Interview, a full-page study of one person, accompanied by an illustrated portrait by Ken Fallin. For reasons that make sense to me, Fallin inspired my photographic selection for this post, above. Because ALDLAND is neither the Journal nor The National Sports Daily, though, more often than not, the interviews are going to have to be imagined. Could A-Rod be the 21st century’s Pete Rose? The New York Yankees third baseman is being investigated by Major League Baseball for participating in illegal poker games and could face suspension. The first allegation came early last month when Star Magazine published a story that several people saw Rodriguez playing in poker games that were also attended by celebrities such as Leonardo DiCaprio, Ben Affleck and Matt Damon. One subsequent article states that A-Rod faces a risk of suspension, while others report questioning of the initial story by A-Rod’s publicist and others. In the big game of baseball legacies, Rodriguez already has two strikes against him and is fouling off pitches due to admitted steroid use, a soft reputation on the field, and a sometimes misguided personal life away from the diamond. But what if it was a gambling problem that actually knocked him out? While there are no allegations A-Rod gambled on baseball or any other sport, it’s Pete Rose’s gambling issue alone that’s keeping him out of the hall of fame. (For more on the baseball hall of fame’s potential anomalies, click here.) Charlie Hustle has all sorts of support, even given his gambling issue. It’s tough to imagine many people clamoring in A-Rod’s defense were this yet-unexplored potential gambling issue to blow up for him. If gambling put Rodriguez out of the game and the hall, it would be the only thing he and Rose had in common.